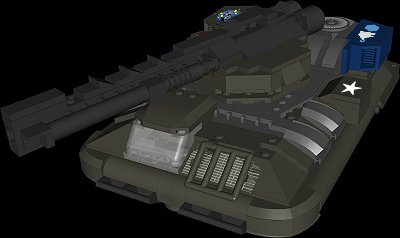 Aldis Industries unveiled their modified Regulator hovertank in 3083 in response to calls for a more resilient fast-attack tank. The Regulator II is heavier that its progenitor by only five tons, and suffers only an 11 percent speed reduction in favor of armor almost three times as thick. 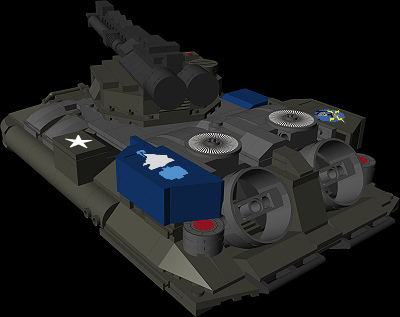 Sporting a lightweight Gauss rifle, this vehicle retains its ability to deliver a heavy punch at long range, and it quickly became a favorite strike vehicle for the Capellan Armed Forces after the Jihad. CC0561-34A was produced for the Capellan Confederation in 3095, and fought in several border skirmishes against opponents of the Federated Suns before it was captured during a disastrous raid against The Republic. The vehicle made its way through several commands in The Republic's Armed Forces until it wound up on Skye when the HPGs went dark. Carmen Hern, its current commander, has nicknamed this vehicle "Slugger."